Dave Brubeck’s 90th birthday is on December 6. Observances are beginning. This weekend in Minneapolis, Minnesota, the Metropolitan Symphony Orchestra under music director William Schrickel will play a celebratory concert with three pieces by Brubeck. They include one of his first extended orchestral works, Elementals, and the U.S. premiere of an adaptation for solo violin and strings of “Sleep, Holy Infant” from La Fiesta de la Posada. Three others pieces on the program are by George Gershwin, Leonard Bernstein and Darius Milhaud, composers Brubeck admires. The Milhaud piece is La Création du monde, the French composer’s 1923 venture into jazz, the music he often credited with revitalizing European art in the 1920s. Following World War Two, Brubeck studied with and was encouraged by Milhaud at Mills College in California. 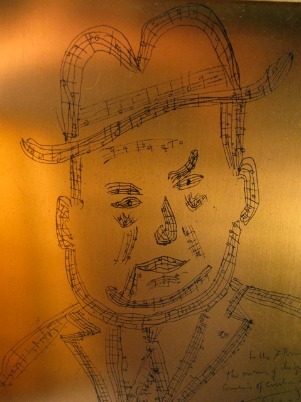 As Schrickel, was planning the concert, Brubeck’s son Chris sent him this photograph of a self-portrait that Milhaud gave the Brubeck family in 1958. The lines of the drawing are themes from La Création du monde. The reference to the “square foot” stems from the fact that Milhaud was a Jewish refugee in this country. His apartment in Paris was destroyed by the Nazis when they occupied Paris and the German elite took over his family home in Aix-en-Provence. His parents remained on the estate disguised as gardeners. Amazingly, no one gave away the secret. However, Milhaud never saw his parents again. They died before the war was over and he could safely return to Europe in 1947. When we were building our new home in Oakland, he asked that we reserve one square foot for him, because he said “I want to have someplace I can stand and say “this is my own”. We did just that. We reserved one square foot–unfinished–in the hearth of the living room fireplace. When he visited us in 1958, he saw the square foot, asked for a piece of paper and the next day we received in the mail the sketch of Milhaud and the themes from Creation du Monde. We have the piece of paper in a safe and had the portrait engraved on copper to place in the hearth. When we moved to the East Coast we brought it with us, and that is what Chris photographed for you. For details about Sunday’s concert and to hear an interview with Bill Schrickel about Brubeck’s effect on his musical life, go here. An additional reminder: the documentary ‘In His Own Sweet Way,’ directed by Bruce Ricker, with Clint Eastwood as executive producer, will be broadcast by TCM at 5 pm ET on Dec. 6, Dave Brubeck’s 90th birthday. What a great post, Doug! I love reading Rifftides. And I’m always amazed at your exploration of the intersection between Jazz and Other Matters (in this case: family, friendship and freedom). Thank you for all of the joy and insights you give me and so many other Rifftides readers on a regular basis. Who or what deserves the credit for La Creation du Dave? M. Milhaud’s far-ranging compositions and all-encompassing thought? Older brother Howard, playing in bands and composing early on? The percentage of restless Native American rhythms in Brubeck’s blood? The influence of that other determinedly odd-duck Dave, the often luckless van Kreidt? Brubeck’s desire to leave horses and cattle in his dust? The astonishing energy and unstoppable drive that have kept him on the road for 70 years? Remarkable, indomitable Iola womanning the homefront? The joy he no doubt still experiences pounding a piano into submission? Probably all of these and plenty more. At 90, the man is a force of nature and a still-living legend (thanks be praised) become a bit more angular and pixieish with age. I look forward to his centenary and the pleasures he’ll be sharing with us before then.